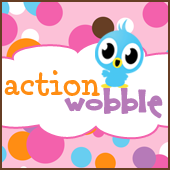 Action Wobble Challenge: Wobble Wednesday Challenge #51! With the end of the school year coming, and so many birthdays during the month of April, I thought it would be fun too use some bright colors that celebrate both of those themes! Primary colors make fun birthday decorations, and are definitely part of a school theme! Congrats to the winner!! !Fun challenge and AWESOME project! Great Explosion box! Nice primary colors - great embellishments used on the explosion box! Wonderful job - and wobble, wobble!